(CNN) -- The father of a New Year's Day baby pleaded guilty Thursday to killing the infant by violently shaking him. 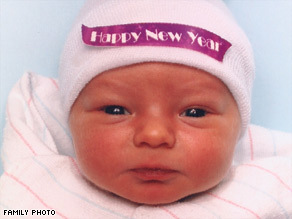 Camryn Jakeb Wilson was the first baby born in 2008 in Summit County, Ohio, arriving at 12:33 a.m. January 1. Craig Wilson's guilty plea in Akron, Ohio, to murder and child endangering charges ended a yearlong saga surrounding the death of Camryn Jakeb Wilson, the first baby born in Summit County, Ohio, in 2008. "This type of crime is always difficult to understand, but today I do hope that Camryn's mother has some closure and that today is one step toward healing," Summit County Prosecutor Sherri Bevan Walsh said. Camryn's mother, Crystal Wilson, had left the 10-week-old infant in his father's care on March 12, 2008, while she attended a meeting. When she returned to their Cuyahoga Falls home she found Camryn in a baby swing, listless and breathing abnormally while her husband of 10 months sat on a couch. Camryn died in his mother's arms, surrounded by other family members, on March 25, 2008, shortly after being removed from life support. Craig Wilson, 29, confessed to police that he was frustrated after an argument with his wife over his ex-girlfriend and a child he had with her. He shook and squeezed Camryn before laying him in the swing but hadn't intended to hurt the infant, he told police. The National Center on Shaken Baby Syndrome estimates that as many as 1,400 babies annually are injured or killed by shaking. Craig Wilson's trial was scheduled to begin Monday. Sinn had hoped to negotiate a plea deal with prosecutors that would send Craig Wilson to prison for a flat 20-year term, but in the end, prosecutors wouldn't budge. "From the moment my client was arrested, he took responsibility for his actions and for the killing of his child," Sinn said. "From a human perspective, that's very admirable. From a defense perspective, it makes it difficult to mount a defense when somebody acknowledges completely their guilt." Judge Lynne Callahan sentenced Wilson to 15 years to life. He is unlikely to be paroled in less than 20 years, Sinn said.